For many citizens it seems that being German is something that presents them with extreme psychological strain. Merkel helps. Deep grief and a continuous feeling of embarrassment, caused by Being German — a human tragedy! Is it possible that external factors (parents, educators, teachers, political Sunday speeches, mass media) may have contributed to this syndrome? Quite obviously this reader never sought out professional help, but instead practiced self-abnegation. In quiet desperation he wasted away; never before had he purchased a foreign passport in Bulgaria or in Turkey. And now Focus was there, live, as he made a spontaneous recovery! Merkel was the remedy for his ailing soul. How high are the estimated numbers of unknown cases? Are we to assume that the motivation behind the Willkommenskultur is a sort of mass psychosis? In a recent large study with over 200,000 participants, it was determined: 14% of all participants had highly sensitive reactions to Merkel’s “We can do it” mantra. They all could be suffering from a psychological mass spell. In the meantime even the Chancellor has prompted speculations as to whether she has psychological problems. She has “lost all her good senses”, and might even need professional help, some say. Can she be helped? Can those Germans be helped, for whom it represents a heavy psychological burden to be German? So far not a single politician has taken on this case. While one part of the German population receives remote healing, the remaining healthy Germans are being plunged into madness. And the country is lying in ruins. This entry was posted in Counterjihad, Culture Wars, Enrichment, Europe, Immigration, Media, News, PC/MC, Politics, Stupidity by Baron Bodissey. Bookmark the permalink. Germany, the German people, seem to be making the same mistake again, and again. Look at who they are embracing to make up for the guilt of the Holocaust, WWII, and WWI. It’s like embracing Hitler to make up for the Kaiser, to make up for the atrocities of Hitler and his efficient capitalist state, to make up for the flawed failure of East Germany. Pathological. Maybe Germany does need to be permanently divided and occupied, into a left brain and a right brain. It’s only 75 years later and the whole brain is starting right in again, civilization on a path to destruction. What was missing from Eisenhower’s follow up plan? Freedom of Speech? “A little poison now and then: that makes for agreeable dreams. And much poison in the end, for an agreeable death.” –“Zarathustra’s Prologue,” Thus Spoke Zarathustra. Like I said before, Leo Strauss nailed it rather well too. “Germans had to pay a terrible price for Hitler.” By which he meant anyone who is political in Germany will be seen as fascistic or a Nazi. Pegida are “Nazis,” etc. What defines our era is the eclipse of the political. It’s eclipsed by moralism or humanism. The Left only appears to be more political because their politics is so rabidly apolitical. Carl Schmitt was perfectly right at least about this much: politics in our day takes the paradoxical form of the apolitical against the political. Yes – with a new Berlin Wall, fencing off muslim Occupied Germany. That’s a, shall we say, distracting last name you have there Mo. But, I do get the gist. Hahaha! 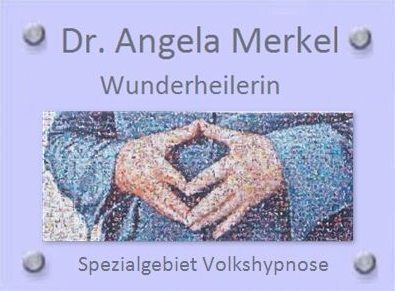 It is not just Merkel, though for her the “measles spots” are most apparent, and so obvious with her position of power. Tony Blair and his Labour party, as his speech writer Andrew Neather, revealed the reason for Britain’s immigration surge. For some one who says they read the koran every day ! ! They supposedly have a reasonable brain, and ability to study. Just what makes them gloss over the details in that book? He says it is a very “progressive” book . Sweden, I am saying nothing, and it is enough said. With those words Hollande had in mind his old adversary and former president Nicolas Sarkozy who said in a recent speech that “immigration threatened the French way of life”. “The French want to stay in France and that France does not look like another country,” Sarkozy had said. “Dismantle the Schengen agreement? That would mean going backwards and restoring borders in each country. “The Schengen agreement is exactly what has allowed European countries to organize and control immigration,” the president said. And on the subject of Islam in France the president criticized the spreading of “fear” around the religion, by those who try to portray it as “incompatible with the Republic”. Hollande said it was “unacceptable” and called on both France and Europe to find an answer “to the bad winds that are increasing in force across both France and Europe.”..
Another one totally ok with islam. Netherlands, Belgium, then Itlay actively helping transport immigrants across the sea. It is just too many all in support of “paneurabia” and with no idea of what it will cost, in health, pensions schemes, social welfare, housing, education. Indeed they believe money grows on trees, or we can dig and delve to obtain more golden eggs from that now soon to be vivisected golden goose. We have too much money for every one, so all come and get it, I wonder if it comes from the cradle to the grave social welfare in peoples lives. Easy come, easy go. The government will take care of it. These same countries going down the gurgler are looking to drag others down, and indeed the whole world. If your country does not take its quota of immigrants, then through some UN formulae, or nebulous carbon tax, whatever, you will be taxed to make up for your non contribution. I have meet a number of European backpackers, that show a very high % of being so deeply inculcated into the EU paneuropean, can not be racist concept. They are so self righteous and impossible to debate with. They talk of themselves immigrating out to other countries, and I really hope not. Fry in your own with all your mass insanity. Where has this concept come from;-, universities, then down through the schools to kindergartens for the past 50 years and now in an uncontrollable state, and of course in an endless loop drawing many others in. It goes through many city governments, regional and to national governments to federal set ups. The systems are well in place, when you hear the expressions, of a grandiose ” I love nature”, “perma culture” with “sustain-ably green”. It seems that they do not grow out of their rose tinted ideas as so many of their peers, through music, media, social media gives no time or ability for them to think. I wonder in the comparison with Germany to Japan. (S. Korea too) There are some Japanese that go initially a bit airy fairy, but prove to be much more open minded to weigh things up. They seem more adaptable and so very quick to knuckle down, and get on with things. Social Welfare, benefits seem to be low or non existent, and it is the family that has to support a person, like an unmarried mother or disabled child. Simpleton, whether or not human activity is warming the planet, the “greens” have a point: we are polluting the place, and using up resources, at such a rate that our successors, if any, will rightly curse us. Just doing my best to make sure that I don’t get illuminated and then eliminated as pollution in any Stalinist cull for eumanity. Focusing on the current garbage trails into Europe would be helpful. Especially when it comes to resources, pollution and the Green stuff. I actually do agree with you, particularly in pollution by excess nutrients, runoff of chemicals into of water ways,, rivers and oceans. General rubbish, should be minimized and maximum recycling, though be aware that you are not using and wasting other resources in following this “holy grail”. Same for air pollution, that fortunately has come along way, and still more to be done. Plant a tree schemes and the money goes into some ones pocket. Greens do not want any tree to be cut, and yet if another or more is planted, you will be well ahead in about 20 years. People are doing this on their own accord, but then run afoul of bureaucracies regulations, often at great cost. Too often trees become a liability to power lines , roads and vechicles, risk of fires, particularly when nil clearance around houses are not allowed. Too often it is en-cloaked with other untested concepts, bureaucracy, all demanding money and costs beyond “practical means” but with Public Relations showing answers that do not work or are a part of extortion. That is the reasoning and thinking I am getting at, this blithe saying people should knuckle down, paying lip service like the Rotherham girls, “#save our girls”. But then if you do not value them, beyond a # then how do you value your environment and the resources that are being used up? that future generations are going to curse us for. Sure we do have to be wise in use of resources, find efficiencies , and get a handle on polluting factors. This airy fairy mindless approach, as fashion, make up, twitter and no real commonsense, is a light philosophy. It is what will happen to the very heavy burden of ongoing immigration into the Western World, shows how light this facade of green thought also is. Maybe they deserve it as the people in Zimbabwe as the Western Civilization supported Mugabe, that is after he killed approximately 20,000 Matabele people so that there would not be too many opposition people to vote against him. After all he has improved now to just stuffing voting boxes. From a food basket, to now desperate food aid beneficiary country. It is difficult for me to look around and see the mindless power and edicts from highly trained professional people, politicians and sycophants, in so many spheres that actually directly impinge on my life, and they blithely espouse their meme, and do not want to look at actual facts or even immediate history where they have stuffed up. I do not claim perfection, just very small areas, where I see repeated stuff ups, and a bit of age makes one become aware of. It has become change for changes sake and “throw out the bath water, baby and all”. So I doubt there will be no successors to curse us. I regard the present wilful destruction of Germany with horror, because its culture has provided me with much pleasure and inspiration over my long lifetime. In particular, German music, created by German speakers in Germany and Austria. Much of my spare time is spent involved in exploring the treasures of German music. In researching one particular piece (the Allegro from Bach’s BWV 998) with a view to producing a transcription, I came across something which, for me, casts into stark relief just what is being destroyed along with the nation of Germany, and what will be lost forever. A link to the YouTube video appears at the end of this comment. But let me prepare you for this feast of pure delight, by pointing out (probably unnecessarily) why I find it so expressive of our loss. A child with prodigious talent has devoted herself to bringing forth an example of the highest level of human achievement in music, attained by one of her countryman predecessors. Enjoy it while you can, because when Germany has been destroyed, females will not receive education, and any learning there may be will be directed towards memorizing a hateful and inhuman mediaeval text. The instrument she plays is a product of a luthier who has distilled the expertise derived from generations of instrument makers, complemented by insights into the physics of sound which modern science and technology have provided. Enjoy it while you can, because when Germany has been destroyed, fragments of shattered instruments such as the one she plays will litter the streets, or be thrown onto bonfires. And the music itself – try listening to the interplay between the two voices. The bass line is a masterpiece of form. Being able to listen to music depends on having been exposed to the idioms of music from an early age. Like any language, if you do not become acquainted with it while your brain is still forming, you will reach a point where you are effectively deaf to its significant elements and idioms. A child can become perfectly fluent in more than one language, and to speak each without an accent. But if you wait until after childhood, you will have much more difficulty in learning the grammar of a new language, and you will never completely get rid of your foreign accent. When Germany has been destroyed, children will not be exposed to music in any form, other than the unmusical wailing of the call to ‘prayer’, and sirens. Music is ‘haram’. No lullabys, folk songs, hymns, chanting in games. So that when, in time to come, the music we now treasure might be encountered by chance, it will sound disorderly and lacking in meaning to someone without the vocabulary to enjoy it and to recognize the musical quotes, references and quips which we take for granted. If, that is, the manuscripts and recordings have not already been burnt. Thank you for this. I wish there were “like” buttons on GoV. The awakening of the population to the danger appears to be so very, very slow and I fear not fast enough to head off the coming catastrophe of civil wars and/or Islamization. The religion of politically correct multiculturalism appears to be very resistant to any kind of reality check. Yes, there are unconscious cultural/psychological forces at work, but still, the looming catastrophe is so obvious you would think it would be enough to cut through some of the conditioning. For a relative few, it is. The violent resistance has already started: I’m speaking about the reports of attacks upon immigration centers. However, I’m sure there are more attacks by the enrichers upon the indigenous population. I know that things can change overnight. I pray that they do. “The awakening of the population to the danger appears to be so very, very slow…” That’s because your thinking is ahead of most other peoples’ – but isn’t that the case with everything? Things are moving in our direction. How many of those wunderbar newcomers are people who think the only problem with Hitler is that “he didn’t finish the job”? But they are Germany’s atonement for the Nazi past. Remarkable. I have family in West Germany…. They say 80% are fuming with the “gutemensch”…. Yes. I have an uncle who is now in his seventies – retired from the workforce – used to be a union representative. We had a run in two months ago at my step-fathers house – who is now a widower – he still spouts the communist ideals that I am so vehemently opposed to. There is no fool like an old fool who can’t admit to the mistakes of socialism that have been so graphically recorded for over one hundred years. I look at this picture and I think She’s a German Hillary. Liberalism is a mental illness. Dr. Savage is right. Merkel has no children of her own but her husband does have and his children have children, and as far as I understand it Merkel thinks much of them. If that’s the case how does it gel with the ‘Merkel hates Germany and the Germans’ explanation for her putting out the welcome mat for the third world’s rejects? Are not the two mutually exclusive? If Merkel hates Germany and the Germans surely it follows that she hates her step-children and step-grandchildren. This I think is unlikely. Merkel is more likely to be fueled by idealism than by hatred – although I have no doubt she hates those of us that want to confront her theory with facts. She’s a head-in-the-clouds world improver, which is why she and her ilk are forever tripping over the cracks in the pavement(sidewalk). 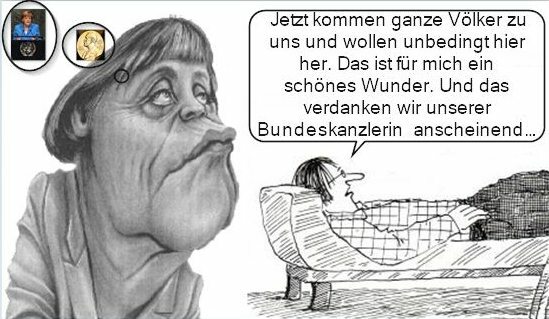 Merkel actually does believe that the importation of the world’s dross will benefit Germany and her step-grandchildren too. It’s an act of faith. That’s how she can ignore the facts – because she believes. It’s not hatred, it’s love. I don’t think Merkel “hates” Germany. She’s a nationalist. She loves Germany as much as Hitler loves Germany, waving her Patriotism for Fatherland in everybody’s face that’s willing to listen. For instance, Obama. He seems to loathe Americans, white Americans anyway, with such passion except for those that march in step with him. He professes his “love” for the USA over and over though. And his “Patriotism” is something he invokes all the time in every speech. Sometimes those post-pub-ponderings can get the old grey matter into overdrive. 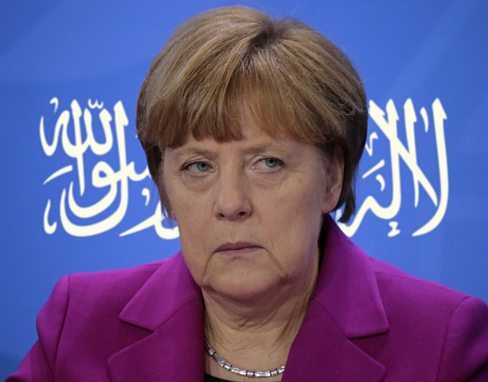 I think Merkel knows very well what she is doing – the destruction of German culture and if that includes a few million dead Germans in the process, then so be it. Merkel believes that she and hers are untouchable in this process – beyond the reach of those she would so easily destroy. But is she? Hubris mixed with a form of psychopathy and megalomania is a very dangerous mix for those in power as it has a tendency to relieve them of any empathy at all for the common citizenry.